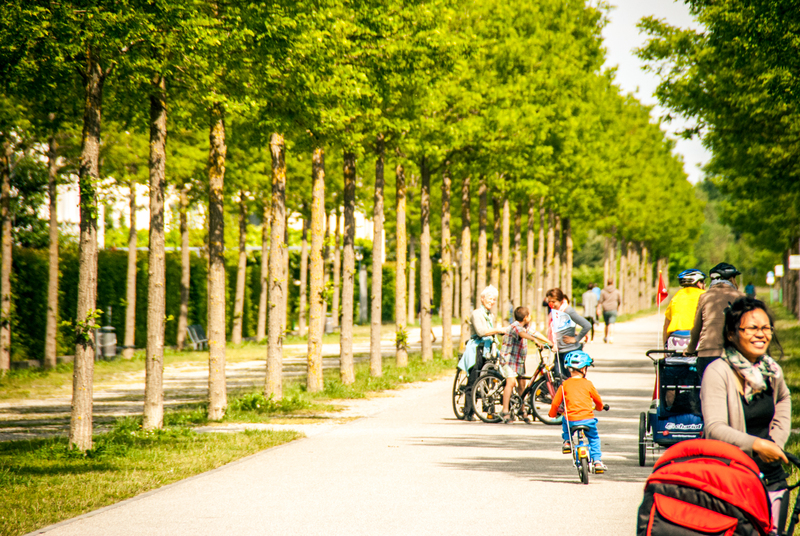 Unlike Zürich, which has (quite understandably) put all of its sustainable transport eggs in the public transport basket, Munich is quite a bit more of a bike friendly city, with an extensive network of cycling facilities. Of course, a huge number of people get around on the public transport network, which is comprised of the S-Bahn (suburban/commuter rail), U-Bahn (subway/metro), buses and a number of tram routes. My impression of travelling around Munich on public transport was that its strengths lay in a relatively dense network with good frequencies and decent opportunities for interchange. The system wasn’t perfect, however - especially compared with that in Zürich. One key problem in Munich is that its S-Bahn lines all run through a single tunnel in the inner city, requiring travel into the centre to reach many destinations and creating the potential for incidents to affect a large number of lines (sound familiar, Melbourne?). The U-Bahn network, though, provided more opportunities for tangential travel, supported by the bus and tram lines. However, a key barrier to such interchange was the inconsistent quality of information and legibility at public transport stops, making such travel difficult for occasional travellers. Some recently redeveloped stations, such as Munchner Freihart (below), however, demonstrated an excellent standard of intermodal interchange. The role of cycling was much larger in Munich than in Zürich (and of course Melbourne! ), with a mode share of almost 15%. Munich has a rather impressive network of cycling infrastructure, much of which is comprised of off-road paths between the footpath and cars (parking or traffic lanes). The result is not only a high proportion of cyclists but a good diversity of gender, age, fitness, etc. A downside to these paths, however, is that space was taken away from pedestrians - this is a relic of the planning mindset of the 80s, a city planner explained - as well as the fact that these types of facilities are perhaps less suitable for longer distance commuter riders. Design of places like train stations played quite a large role in the success of both public transport and cycling. A good example of this is Munchner Freihart, which is mentioned above. Some of the S-Bahn stations (e.g. Pasing and Laim) had huge provisions for high quality bicycle storage, as well as including bicycle lanes in station underpasses (below), allowing for through movement and reducing the barrier posed by major rail corridors. These stations had significant numbers of cyclists and pedestrians moving through or interchanging with a range of public transport. I visited Messestadt Riem, a recent redevelopment area discussed in the first article in this series, to observe the relationship between what was intended to be achieved and what actually occurred. The area was intended as a pilot for “car free living” projects but these were largely unsuccessful, despite the timely provision of public transport (the U-Bahn extension servicing the area opened the same year as the first residents moved in). In contrast to more inner areas, there was a high provision of on-street car parking, and commuter cyclists tended to be a less diverse bunch (i.e. confident men riding quickly on expensive bicycles) - although there was a greater diversity in people using bicycles to interchange with the U-Bahn. One quite positive element was the shared paths in the open space, which were safe, attractive, and utilised by a broad range of people. Once again, the question is what we can learn from this city for Melbourne. An important point to note is that we can learn from shortcomings as much as successes. For example, the (very useful) 1980s-era off-road cycle paths would not today be created by taking space from pedestrians. Thus, infrastructure in Fishermans Bend should be delivered correctly from the beginning, rather than creating the challenge of retrofitting in the future. In a similar vein, creating this type of infrastructure and catering for anybody other than the “avid cyclist” group has great potential for increasing cycle mode share by targeting the significant proportion of non-cyclists who are open-minded but cautious. Movement networks (pedestrian and cycling) through open space could also play a major role for these groups; open space and its design must not be neglected in planning for Fishermans Bend. Munich’s public transport demonstrated the importance of interchange, tangential movement and ease of use; the success of its public transport in various points in the city appeared largely to hinge on these three factors. These user-oriented elements need to be instrumental in the planning of the public transport supply in Fishermans Bend - whether this is the Melbourne Rail Link, a new tram route or bus services. 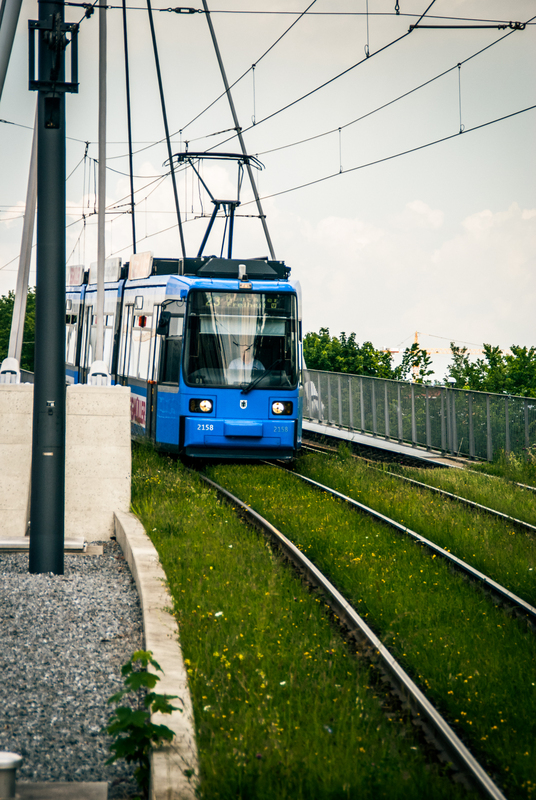 Another useful lesson was the provision of heavy rail to Messestadt Riem (below) from the beginning of residential occupation, which established sustainable transport habits and reduced car ownership. If the Melbourne Rail Link cannot be provided in time to service Fishermans Bend’s first residents, alternative public transport must be supplied to avoid new residents and workers turning to the car from the beginning. This must actually connect people to where they need to go - something that will require network-wide planning, rather than merely building a new station in isolation. Lastly, something to aim for in Melbourne is a cultural change towards a “transportation discussion culture” (as one city planner put it), with public awareness of issues such as limited space, the inefficiency of private car travel and the environmental impacts of transport. It is very difficult to transplant cultural factors such a greater acceptance of bicycles or the need for compact settlement around public transport infrastructure. Nevertheless, what the government can do in planning for Fishermans Bend is engage in open dialogue about transport system priorities and trade-offs with its constituency (including the Cities of Melbourne and Port Phillip) in order to generate community buy-in and increase the likelihood of successful implementation of sustainable transport ideas.